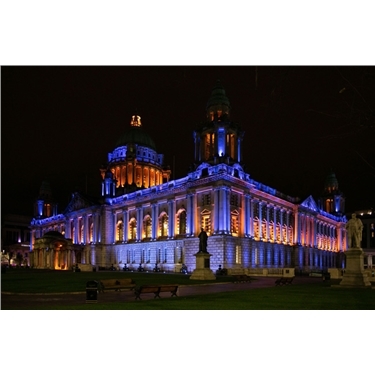 The Belfast Adoption Centre's 25th birthday celebrations in 2018 culminated with Belfast City Hall being illuminated in the charity's colours of blue and yellow on Monday 29 October. Centre Manager Bel Livingstone commented "Seeing the iconic Belfast City Hall lit up in Cats Protection's colours really is a fitting end to a couple of weeks of fantastic celebrations in honour of the Belfast Adoption Centre's 25th anniversary." "It really is a proud moment for the Belfast Adoption Centre staff and volunteers, both past and present, and a reminder of all we have achieved together over the years to further feline welfare within Northern Ireland. Here's to another 25 successful years!"